Authors: Hideki Tanimura, Gary Hinshaw, Ian G. McCarthy et al. Baryons or normal matter comprise only a tiny fraction (~5%) of the total density of the Universe. However, this does not stop them from playing hide-and-seek with astronomers. Even after subtracting off the baryons locked up in stars, the interstellar medium, and hot gas in galaxy clusters, we are still missing 50% of the baryons. Simulations suggest that most of the “missing baryons” could be in the form of low-density warm-hot gas that threads the cosmic web between galaxy clusters, known as the warm-hot intergalactic medium (WHIM). The cosmic web is an invisible network of dark matter filaments that form the backbone of the large scale structures of the Universe, as illustrated on the front page of today’s article by The Millennium Simulation Project (see this Astrobites post for a detection of a dark matter filament). The low-density of the WHIM makes them very difficult to detect, with only a handful of non-definitive detections in the UV and X-rays. Since we cannot directly observe the WHIM with current telescopes, we need to infer their existence through indirect means. The authors of today’s paper used the tSZ map from the Planck satellite to search for hot gas in the dark matter filaments between close pairs of LRGs. Using the latest data release from SDSS, they first constructed a catalog of LRGs that are verified to be central galaxies in galaxy clusters. They then looked for neighboring LRGs that are within a transverse distance of 6-10 Mpc/h and within a radial distance of 6 Mpc/h from the central LRG catalog. 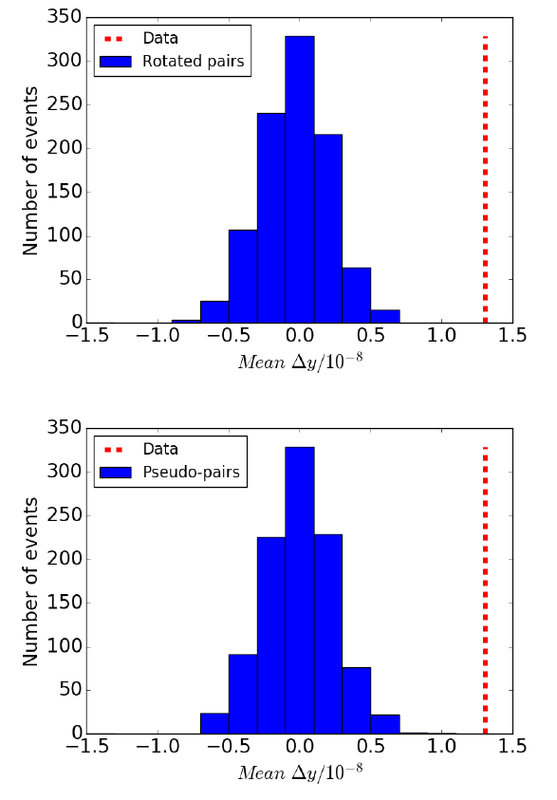 According to simulation studies, cluster pairs separated by these distances tend to be connected by dark matter filaments. The tSZ map is then stacked on top of the LRG pairs. The average tSZ signal, after removing background contribution, at the positions of the LRG pairs is shown on the left panel of Figure 1. Before you declare victory, it is important to know that most of the signal you see is actually due to the halo gas associated with the individual pair, which is modeled on the right panel of the same figure. The residual tZS signal after subtracting the halo gas contribution is shown in Figure 2. There appears to be a bright blob with an elongated structure connecting the LRG pairs — this is the real stuff, actual detection of filamentary hot gas. But wait, is the signal real? The authors performed two tests to convince the skeptics. In case the signal they see is a systematic signal from the galactic background, they repeated their analyses by rotating the centers of the LRG pairs by some random angles in their galactic longitudes. If the signal is real, it will be washed away by the randomization. They also repeated their analyses with pseudo LRG pairs, i.e. 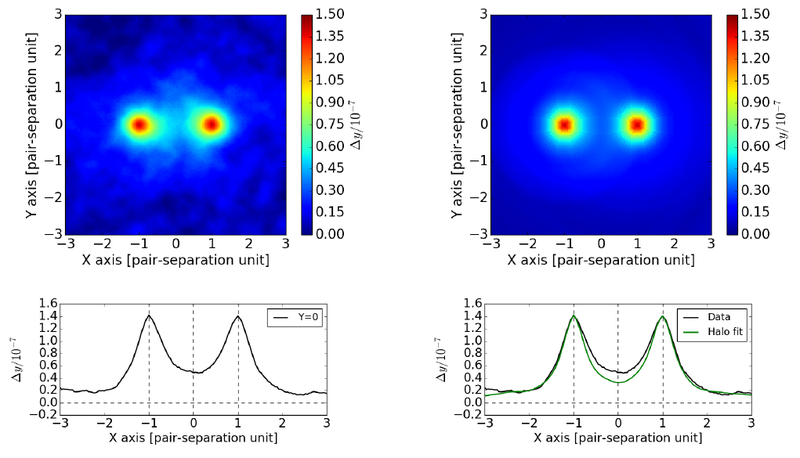 pairs that only satisfy the transverse (but not the radial) separation condition, which are not expected to be connected by dark matter filaments. Figure 3 shows the results of their tests, which both produce a mean zero signal, consistent with their detection being real. An emerging trend in observational analyses is to compare results with simulations. 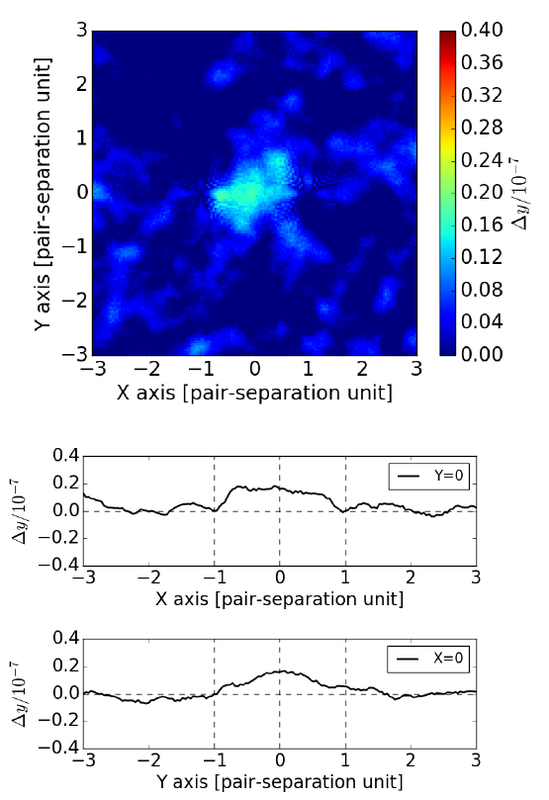 The authors applied their analyses on simulated data from a cosmological hydrodynamics simulation (simulation that includes fluid motion and normal matter) and obtained marginally consistent, albeit slightly weaker, signal. Hopefully with more data from future surveys, we can scoop up the remaining baryons hiding as hot gas in the cosmic web and finally get our baryonic accounting right.